Researchers at MIT have developed a new approach to measure electrical activity deep in the brain: using light — an easier, faster, and more informative method than inserting electrodes. They’ve developed a new light-sensitive protein that can be embedded into neuron membranes, where it emits a fluorescent signal that indicates how much voltage a particular cell is experiencing. This could allow scientists to study how neurons behave, millisecond by millisecond, as the brain performs a particular function. Better than electrodes. “If you put an electrode in the brain, it’s like trying to understand a phone conversation by hearing only one person talk,” says Edward Boyden*, Ph.D., an associate professor of biological engineering and brain and cognitive sciences at MIT and a pioneer in optogenetics (a technique that allows scientists to control neurons’ electrical activity with light by engineering them to express light-sensitive proteins). Boyden is the senior author of the study, which appears in the Feb. 26 issue of Nature Chemical Biology. “Now we can record the neural activity of many cells in a neural circuit and hear them as they talk to each other,” he says. The new method is also more effective than current optogenetics methods, which also use light-sensitive proteins to silence or stimulate neuron activity. “Imaging of neuronal activity using voltage sensors opens up the exciting possibility for simultaneous recordings of large populations of neurons with single-cell single-spike resolution in vivo,” the researchers report in the paper. Robot-controlled protein evolution. For the past two decades, Boyden and other scientists have sought a way to monitor electrical activity in the brain through optogenetic imaging, instead of recording with electrodes. But fluorescent molecules used for this kind of imaging have been limited in their speed of response, sensitivity to changes in voltage, and resistance to photobleaching (fading caused by exposure to light). Instead, Boyden and his colleagues built a robot to screen millions of proteins. They generated the appropriate proteins for the traits they wanted by using a process called “directed protein evolution.” To demonstrate the power of this approach, they then narrowed down the evolved protein versions to a top performer, which they called “Archon1.” After the Archon1 gene is delivered into a cell, the expressed Archon1 protein embeds itself into the cell membrane — the ideal place for accurate measurement of a cell’s electrical activity. Using light to measure neuron voltages. When the Archon1 cells are then exposed to a certain wavelength of reddish-orange light, the protein emits a longer wavelength of red light, and the brightness of that red light corresponds to the voltage (in millivolts) of that cell at a given moment in time. The researchers were able to use this method to measure electrical activity in mouse brain-tissue slices, in transparent zebrafish larvae, and in the transparent worm C. elegans (being transparent makes it easy to expose these organisms to light and to image the resulting fluorescence). The researchers also showed that Archon1 can be used in conjunction with current optogenetics methods. 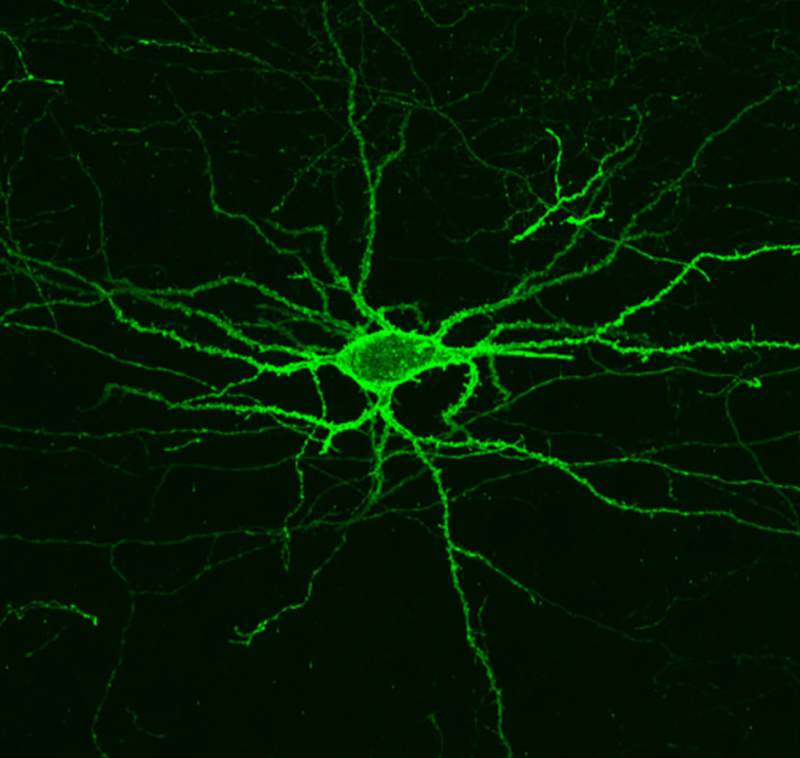 In experiments with C. elegans, the researchers demonstrated that they could stimulate one neuron using blue light and then use Archon1 to measure the resulting effect in neurons that receive input from that cell. Detecting electrical activity at millisecond-speed. Harvard professor Alan Cohen, who developed the predecessor to Archon1, says the new protein brings scientists closer to the goal of imaging electrical activity in live brains at a millisecond timescale (1,000 measurements per second). * Boyden is also a member of MIT’s Media Lab, McGovern Institute for Brain Research, and Koch Institute for Integrative Cancer Research, and an HHMI-Simons Faculty Scholar. ** The researchers made 1.5 million mutated versions of a light-sensitive protein called QuasAr2 (previously engineered by Adam Cohen’s lab at Harvard University and based on the molecule Arch, which the Boyden lab reported in 2010). The researchers put each of those genes into mammalian cells (one mutant per cell), then grew the cells in lab dishes and used an automated microscope to take pictures of the cells. The robot was able to identify cells with proteins that met the criteria the researchers were looking for, the most important being the protein’s location within the cell and its brightness. The research team then selected five of the best candidates and did another round of mutation, generating 8 million new candidates. The robot picked out the seven best of these, which the researchers then narrowed down to Archon1. We developed a new way to engineer complex proteins toward multidimensional specifications using a simple, yet scalable, directed evolution strategy. By robotically picking mammalian cells that were identified, under a microscope, as expressing proteins that simultaneously exhibit several specific properties, we can screen hundreds of thousands of proteins in a library in just a few hours, evaluating each along multiple performance axes. To demonstrate the power of this approach, we created a genetically encoded fluorescent voltage indicator, simultaneously optimizing its brightness and membrane localization using our microscopy-guided cell-picking strategy. We produced the high-performance opsin-based fluorescent voltage reporter Archon1 and demonstrated its utility by imaging spiking and millivolt-scale subthreshold and synaptic activity in acute mouse brain slices and in larval zebrafish in vivo. We also measured postsynaptic responses downstream of optogenetically controlled neurons in C. elegans.